For the refreshed, 2018 Ford Mustang, which ups the ante over the 2017 model with 460 normally-aspirated horsepower thanks to a new dual-injection system and a 7,500-rpm redline, the guys and gals over at Roush Performance have brought out what could be one of the best performance-enhanced Ford pony cars yet: the 2018 Roush JackHammer Mustang. Named – presumably – after company founder and NASCAR team owner Jack Roush, the Roush JackHammer packs a 710-horsepower wallop courtesy of a Roush TVS 2650 supercharger package. The blower is from Eaton’s spectacular Twin Vortices Series line, and it displaces 2,650 cubic centimeters. Benefits over the older TVS 2300 include 4% better efficiency, and 18% less input power required. But that supercharger is far from the only thing separating the 2018 Roush JackHammer Mustang from lesser pony cars. The new high-performance model also features a high-flow upper grille with a “JH” badge, high-flow lower opening, and lower-temperature radiator system components for superior cooling during hard use. A pair of extreme-duty half shafts ensure that all 710-horsepower makes it to the wheels reliably, and the JackHammer boasts a one-way-adjustable performance coilover suspension system, “JH” strut tower brace, and 20-inch “Black Jack” wheels wrapped in Continental ExtremeContact Sport rubber. 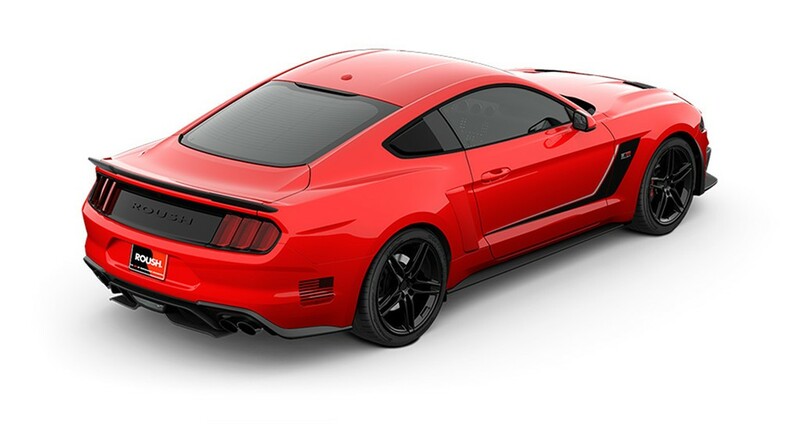 The full suite of Roush Performance body enhancements has made it onto the Roush JackHammer Mustang, too: a front chin spoiler, wheel shrouds, aero corner pockets, hood heat extractors, low-gloss black decklid spoiler, body color side scoops, and rear valance aero foils. Further enhancing the appearance is a set of Roush fender badges, rear blackout panel with Roush badging, and a set of hockey stick vinyl graphics on the body sides – a touch previously reserved for Roush’s Stage 3 Mustangs. Inside, Roush embroidered floor mats, a Roush Design gauge cluster, illuminated door sill plates, and a dash-mounted medallion with the model name and serial number all help communicate the JackHammer’s specialness. The 2018 Roush JackHammer Mustang is available starting at $14,765 on top of the price of the donor Mustang GT. The package is only available for fastback examples, but it’s compatible with both factory transmissions – the 6-speed manual and the 10-speed automatic – and comes with a 5-year/60,000-mile limited warranty on the powertrain components. Plenty of optional parts – including billet performance pedals, forged wheels, and a three-way-adjustable TrakPak coilover suspension – are available. For more information, visit RoushPerformance.com.